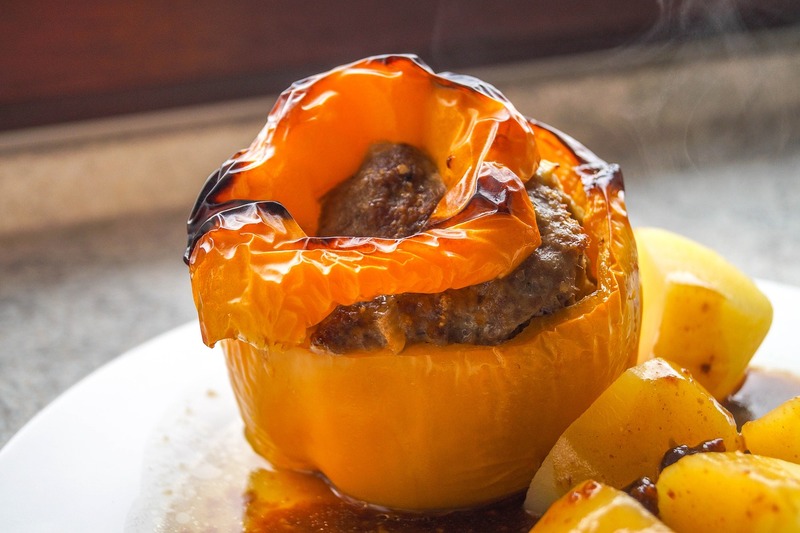 German stuffed peppers are filled with meat and are called in German "Gefuellte Paprika". This German dish is easy to make and can be varied. If you don't like to use meat fill the peppers with a rice-vegetable mix. You can also use ground Bison meat or a mix of pork and beef. Happy Cooking! - Cut off the upper part of the pepper (the lid); remove white parts and seeds inside the pepper with a sharp knife or a spoon. - Chop onions fine; in a pan heat butter and saute onions until transparent; add the meat and brown it just a bit. Remove from heat. - Add rice to the meat and mix it well; add parsley, salt, pepper, nutmeg, and red paprika powder. Mix well. - With a spoon fill meat-rice mix into each pepper. - In a heavy sauce pan fill in the tomato sauce or chopped fresh, or diced tomatoes. - Add herbs, spices and bring to a boil. - Place the filled peppers into a big enough pot. They should not fall aside. (Tip: before you fill the peppers place them into the pot to see if it is the right size). - On very low heat let peppers simmer for 15-30 minutes depending on the size of the pepper (needs to be covered with a lid). The rice is uncooked so it needs to cook until it is soft. They are done when they won't show their fresh green color. - 10 minutes before the pepper is done, add the lids on top of each pepper. Serve them with mashed potatoes, boiled potatoes, or your favorite pasta. You can add zucchini, carrots, peas or leek to the tomato sauce. For the vegetarian version, mix rice with chopped carrots, peas and mushrooms, fill the peppers and let simmer covered the same way as described above in the recipe.